For children's books, go to the Peanuts Books for Kids Page. Snoopy & The Gang 4-Piece Toddler Bedding Set This 4 piece toddler bedding set features the always popular Snoopy! Includes a "hugger" comforter, standard sized pillow case, and a top and bottom sheet. These fit on a CRIB sized mattress for a toddler bed. Comforter is 42"W x 57"L, and pillow case measures 29-1/2"W x 20"H. They are made of 50/50 polyester/cotton and are machine washable. By Delta Enterprise Corp Seat your little on in the middle of this colorful Baby Snoopy activity walker, with clever interactive toys and musical toy bar to keep your little one busy for hours. The patented wheel design meets all safety standards; the back wheels are stationary and the front wheels are moveable to provide more stability. 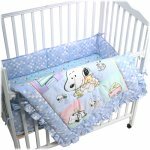 By Lambs & Ivy Bedtime Sleepytime Baby Snoopy set includes comforter, bumper and printed character sheet. By Lambs & Ivy Bedtime Whether he's being cradled by the moon or cuddling up with his feathered friend Woodstock, this classic animated character is a breed apart. Coming to life in shades of periwinkle, lemon, raspberry, orange, and mint green, this four-piece bedding set includes a comforter, bumper, sheet, and dust ruffle. By Lambs & Ivy Bedtime Whether he's being cradled by the moon or cuddling up with his feathered friend Woodstock, this classic animated character is a breed apart. Coming to life in shades of periwinkle, lemon, raspberry, orange, and mint green, this My Little Snoopy sheet coordinates with other items and accessories from the My Little Snoopy collection. Machine washable and dryer safe. By Lambs & Ivy Bedtime Popular Snoopy printed blanket. Deluxe high pile soft and cozy blanket for baby. Washable in warm water and warm temp dry. Keep baby comfortable in this remarkable plush blanket. By Lambs & Ivy Bedtime Whether he's being cradled by the moon or cuddling up with his friends, My Little Snoopy is a classic. By Lambs & Ivy Bedtime This product is perfect for finishing off your nursery decor. The theme is great for boys or girls and the colors match almost anything. Machine washable and dryer safe. By Lambs & Ivy Bedtime Coordinating with the My Little Snoopy bedding set, this musical mobile plays Brahms's Lullaby. By Lambs & Ivy Bedtime My Little Snoopy plush lamp coordinates with bedding ensemble. By Lambs & Ivy Bedtime The My Little Snoopy wall-border coordinates with other bedding accessories from the My Little Snoopy collection. By Lambs & Ivy Bedtime Part of the My Little Snoopy nursery collection, this handy diaper stacker is a great way to keep your disposable or cloth diapers within reach and neatly organized in your child's nursery. By Pacesetter This ramie and cotton printed bag has multiple organizer features and comes with a bottle warmer, wipecase, and changing pad. By Delta Enterprise Corp Soothe your fussy infant with the gentle motion of the Baby Snoopy deluxe bouncer. This bouncer icludes lights, sounds and musical toy bar with 3 dimensional Snoopy and Woodstock characters. The toy bar is also detachable to charm and entertain your baby while away from the bouncer, one speed vibration is provided to simulate the motion of a car or your baby can just gently bounce in place. Included is a canopy to keep light out in the event your baby decides to take a nap. By Delta Enterprise Corp A truly modern bassinet with a small electronic control which offers a gentle vibration feature to gently rock your baby to sleep while playing classic lullabies. Other great features include an adjustable canopy, large mesh basket, 2 plush Baby Snoopy toys and locking caster wheels to keep the bassinet stable. Even with its high-tech electronics, this bassinet has a classic design to it. By Lambs & Ivy Bedtime This comic book classic is a breed apart! My Little Snoopy comes to life in fresh shades of periwinkle,lemon,raspberry,orange and mint green.